Find hotel near Casa Del Marquez De Valde ..
Once owned by slave and flour trader Marquis de Valdehoyos, this building is today the location of the Chancellery of the Republic. 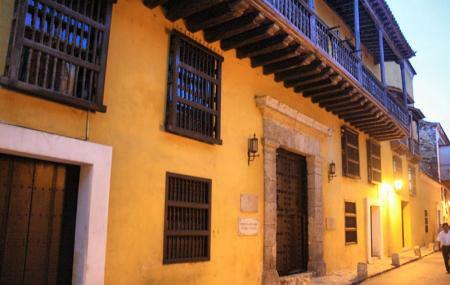 The building is a classic colonial example from the 17th century - yellow facade, two stories, balconies and a rear courtyard. Inside, the floors and ceilings are wooden. Apparently even Simon Bolivar once lived in one of the rooms of this house. From atop the spiral staircase on the third floor the house provides a wonderful view of the sea and the harbour. For the public, the building primarily functions as a cultural events and conferences space; make sure to find out about upcoming events before your visit to the city. Admission prices may depend on the event. The hours given here may not be accurate. Call the attraction and confirm visiting times ahead of your visit. One of Catagena's jewels. A must see.